Today Gametime, the company delivering the best experience for the last-minute fan, further embraces the spontaneity of millennials and gen-z with the introduction of LastCall: a new way to get into live events up to 90 minutes after the start. The rapidly growing ticketing company has sold hundreds of millions of dollars worth of tickets to date through its mobile-first platform, which enables people to buy and sell tickets to sports, concerts, theater and more in just seconds. To continue scaling the company, Michael Kunde, a former executive at Spring Education Group, Electronics Arts, and Gap, Inc., joins Gametime as Chief Financial Officer. As younger generations continue to opt for experiences over material things, Gametime is committed to putting the fan experience first by offering an easier and faster way to get into live events. With 60 percent of all Gametime purchases happening within 36 hours of an event, the demand for last-minute tickets is clear. As this behavior grows, the company sees LastCall as an answer to its fans’ spontaneous lifestyle. In 2018, the top 100 music tours saw an 11 percent decrease in ticket sales. Meanwhile, Major League Baseball (MLB) saw a four percent decline in attendance and the National Football League (NFL) saw it’s lowest regular-season attendance since 2011. Unsold seats leave over $1 million on the table per game for professional sports teams. LastCall fills these unsold seats by making it seamless to get into an event once it’s begun. 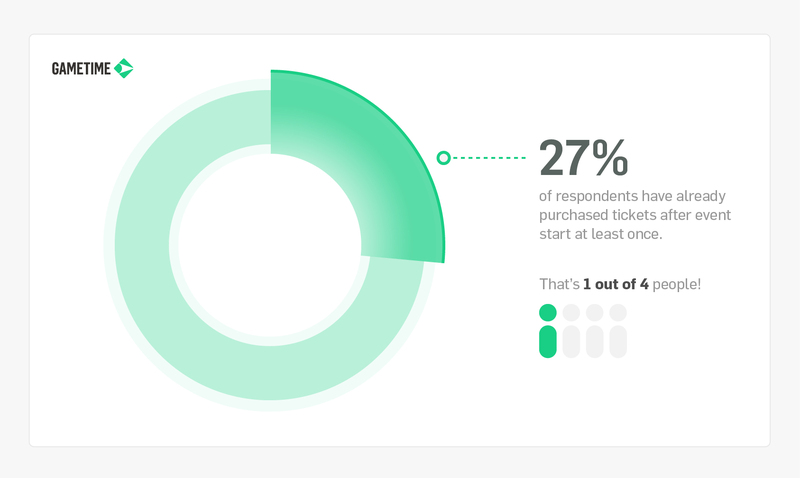 Already a fan favorite of eleventh-hour buyers, Gametime surveyed both Gametime and non-Gametime event-goers and uncovered a new trend of getting tickets to an event after it’s started. Of the 287 respondents, 27 percent had purchased tickets after an event’s start time, 62 percent of whom were gen-z or millennial event-goers. Beyond enabling more spontaneous live experiences, LastCall also helps attract more price sensitive fans. According to Gametime data, the median MLB ticket price 48 hours prior to the game is $48. Ninety minutes after the first pitch, that price decreases to $13. The National Basketball Association sees median prices of $127 48-hours before an event, which falls to $40 90-minutes after tipoff. For music fans, data shows that prices fall from $114 48-hours pre-start to $55 90-minutes into a concert. Gametime data shows similar savings leading up to and after an event starts across all major music and sporting events. Alongside a growing last-minute market, the company delivered 80 percent year-over-year growth from 2017 to 2018. To support growth and momentum in 2019, Gametime is announcing the hiring of Michael Kunde as its new Chief Financial Officer. Kunde brings more than 20 years of experience in consumer and entertainment sector to the company. Previously, Kunde held executive roles for leading companies in both the consumer and education space including Electronics Arts, Polo Ralph Lauren, and Gap, Inc. Most recently, Kunde served as Chief Financial Officer for Spring Education Group, a private-equity owned education company, where he oversaw significant revenue and earnings growth over a four-year period through both organic growth and acquisitions. “I am very excited to be joining Gametime as it continues to scale into a dominant brand for Gen-Z and millennials" said Michael Kunde, Gametime’s Chief Financial Officer. To experience LastCall, download the Gametime app from the App store or the Google Play store. Gametime surveyed 287 people and a combination of its own users as well as non-Gametime users via Survey Monkey in January 2019. All sample surveys and polls are subject to multiple sources of error which are most often not possible to quantify or estimate, including sampling error, coverage error, error associated with nonresponse, error associated with question-wording and response options, and post-survey weighting and adjustments. For complete survey methodology, please contact rachel@vscconsulting.com. Gametime is the leading mobile marketplace for last-minute tickets to live events. With Gametime, you can buy and sell tickets to sports, concerts, theater and more, in just seconds — even after the event has started. Gametime presents only the best value tickets, offering a two-tap check-out that delivers tickets directly to your phone. Founded in 2013 to unite the world through shared experiences, Gametime is available in 60 markets in the U.S. and Canada. To learn more, visit gametime.co, or download the app from the App store or the Google Play store.